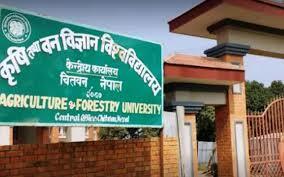 Chitwan – The Agriculture and Forestry University (AFU) has come in to regular operation from Monday. The university students and teachers had resorted to shut teaching and learning activities after the university granted its affiliation to eight private campuses. With the call-off of protest after government's decision to revoke university's decision, the curricular activities have come to resumption. University's Registrar Manaraj Kolakshyapati shared that the administrative and curricular activities have come in to regular and smooth operation.